Heart shapes are actually one of the rarest of the fancy cuts and are quite hard to find. Pear shapes are much more common, since pears can be attractive in different proportions, from a fat pear to a long elegant teardrop. But heart shaped gems are only attractive and well-formed when the proportions (height:width) are in the range of 1:1 to 1:1.2. 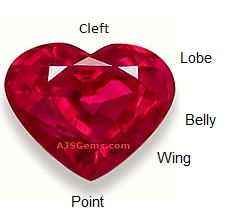 A well-cut heart shaped gem will display balanced proportions and symmetry, with lobes that match in size and shape and curve smoothly to the point. The cleft can vary in depth, but should display a well-defined V shape. 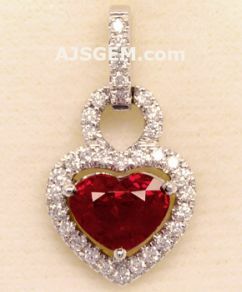 Give your heart to your beloved this Valentine’s Day, and celebrate the day with a heart shaped gem. It will be a gift you’ll both treasure for years to come. Happy Valentine’s Day! This month we feature romantic heart-shaped gems, just in time for Valentine's Day! Click on any photo to view the details for the gem. 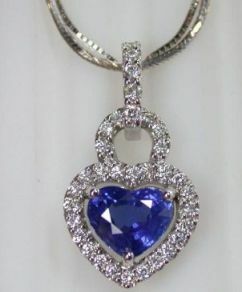 A geautiful gemmy heart shaped blue sapphire for your sweetheart. It is a pretty royal blue which bursts with color from all angles. A perfect gemstone for that special someone. Guaranteed natural. A very fine Mexican fire opal in a vivid orange-red! Precision cut with very good clarity, this lovely heart shape will set up beautifully in your jewelry design. Guaranteed natural and untreated. A fine Tsavorite Garnet heart with a rich chrome green color! This is very clean material, cut with care and polished to perfection. This fine Tsavorite will make a gorgeous ring. Guaranteed natural and untreated. A lovely matched pair of Mandarin Garnets in a romantic heart shape. These are very bright and lively with a lot of sparkle, ready for your earring design. Guaranteed natural and untreated. An impressive Gem Silica heart in a vivid bluish-green. The excellent translucency gives this fine cabochon a wonderful glow. A perfect gem for a stunning pendant. Guaranteed natural and untreated. A fabulous pink-red spinel from the Mahenge region of Tanzania in the rare 4 carat size! These rare spinels have a neon-like glow that is unique in the gem world. Excellent color saturation and perfect size for an important ring or pendant. Certified as natural and unheated by GemResearch Swisslab (GRS) with the color noted as "vibrant pinkish-red" and origin "Tanzania". A remarkable gem that we guarantee will draw comments. A superb 10.04 ct Burma Ruby and Diamond Ring sold for $7.23 million at Christie's Magnificient Jewels auction in Hong Kong in November. 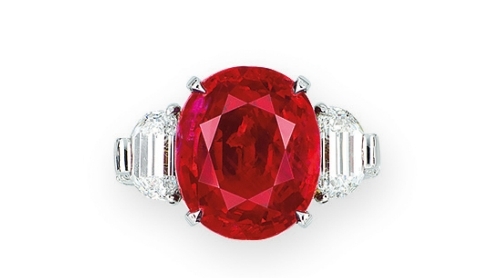 The unheated oval Ruby, set in a gold and platinum ring with half-moon and round diamonds, displays excellent clarity and the top pigeon blood color. Though not a record price-per-carat, it was one of the finest Burma Rubies offered at auction in recent years. Eye clean is considered to be the key clarity grade in the gem trade, since its the minimum standard for a fine gem. A gemstone is considered to be eye clean when no inclusions are visible to the naked eye from a normal viewing distance (about 12 inches), when the gem is viewed looking down through the table. Since most natural gemstones have some inclusions, you may be able to detect inclusions in an eye clean gem, either by inspecting the gem under a loupe or by examining the gem through the pavilion. The important thing about the designation eye clean is that it indicates that any natural inclusions in the gem will not be visible or detract from the beauty of the gem when set in jewelry.